Submerge their hands in water that was either very cold (<3º) [Pain] or at room temperature (>24º) [No Pain]; ostensibly to complete a sorting task with balls located at the bottom of the water container. Perform a wall squat “with back straight and knees bent at 90º” for as long as possible [Pain] or attempt to balance on one leg for 60s (with the ability to switch legs if tired and/or use balance aids) [No pain]. These tasks were each performed individually but in the presence of a small group (2-5 people), who also performed the same tasks. Predictably (and fortunately for the experimenters), those who experienced the cold water and painful wall squat endurance task reported their experiences as being more painful and more unpleasant than those who performed the warm water and balancing tasks. However, the significant finding was that those who endured the painful version of the tasks also reported feeling more bonded with the other participants, as measured in experiment 1 by how far they agreed with statements like: “I feel connected to the other participants” and “I feel like there is a unity between the participants in this study”. The size of the difference detected was quite substantial and remained when the researchers controlled for other possible confounding factors such as age, gender and group size (see the bar chart near the bottom of this post). For their 2nd experiment, instead of a self reported measure of ‘bond’ the researchers used a behavioural measure of cooperation which involved a (relatively) simple economic game. The rules of the game specified that each participant should select a number between 1-7, with the biggest possible payoff ($7.80) for all participants available if everyone in the group selected 7. The catch here was that if you selected a high number, but some other member of the group selected a lower number you would be penalised. So for example, if you picked 7 and someone else in the group picked 1, regardless of everyone else’s choices, you would only receive ($0.60) and they would receive ($4.80). The rules of this game meant that if you want to play it safe you should just pick 1, as you will be guaranteed at least $4.80, and alternatively if you strongly trust everyone else in your group, you should select 7 as this will bring the biggest individual and collective reward, as long as no-one else defects by selecting a lower value. 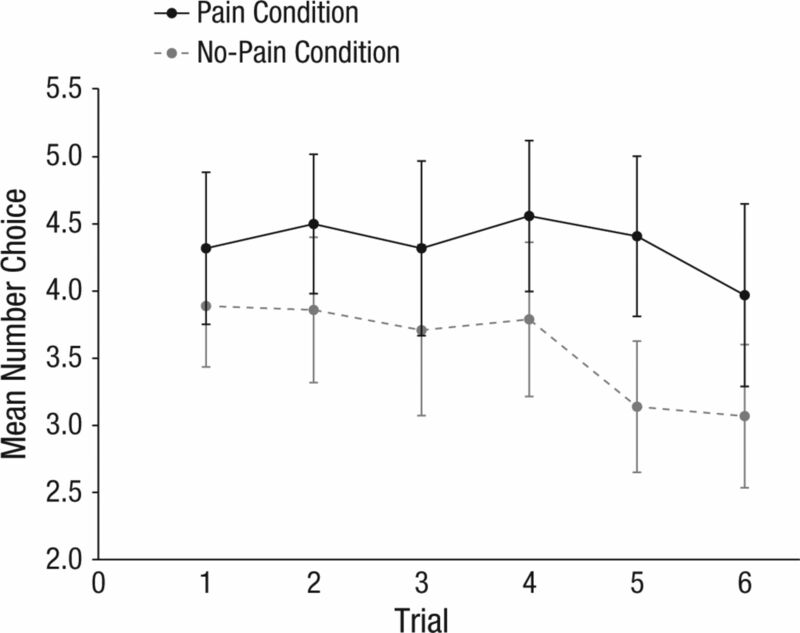 Using this game -played over six rounds- the researchers found a significantly higher rate of cooperation/trust evident in the pain condition (see the graph below). Again, in experiment 2 the experimenters controlled for age and gender and found no effect but they did find responses in the cooperation task to be affected by group size and for average group size to be unequal between the conditions. When controlling for this their result remained significant but it is worth noting that the effect observed dropped from p < .001 to p=.48, right at the boundary of what is recognised as statistical ‘significant’ (i.e. p<.05). 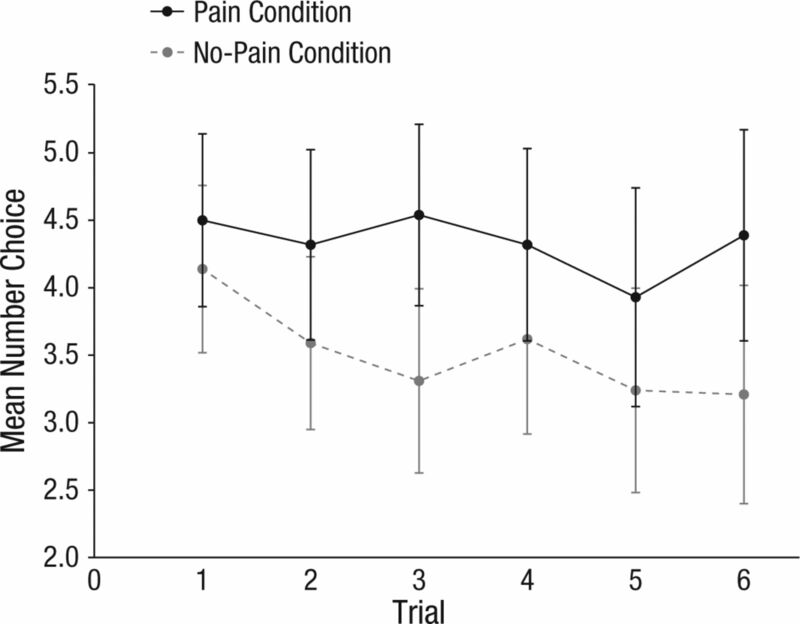 Fortunately, the study has a 3rd experiment, which employed the same economic game as experiment 2, and found the same enhanced cooperation in the pain condition, but this time without the group size confound between conditions, which increases confidence that the result can not be attributed to some experimental artefact. Interestingly, the 3rd study also employed an entirely novel means of manipulating pain based around a cover story of a consumer preference test and the consumption of a very hot chilli pepper(!) [pain] vs. a hard candy [no pain]. This new task meant that there was less chance that the observed results were due to other factors associated with competition/or the perceived success in the sorting/endurance tasks. Helpfully the study authors explain that “Participants in the no-pain condition were instructed to hold the candy in their mouths rather than to chew it for the entire 2 min” and that they kindly provided yogurt and water “as necessary in the pain condition” (Bastian et al. 2014: 5). With this new manipulation, as mentioned above, experiment 3 replicated the result of significantly elevated cooperation found within the pain condition (chilli eating) groups (see the graph below). This is a neat paper, showing a consistent result across three experiments (see the bar chart below) and providing an interesting methodological innovation in the form of the hot chilli task. And while the authors clearly admit they have not identified a mechanism for the effects observed, they highlight that their results could not be explained by individual’s emotional response to the tasks (both positive and negative), nor by individual’s appraisals of the challenge or threat involved. This doesn’t rule them out as playing a role in real situations involving collective pain but implies that the ‘bonding’ effects of pain are acting independently. 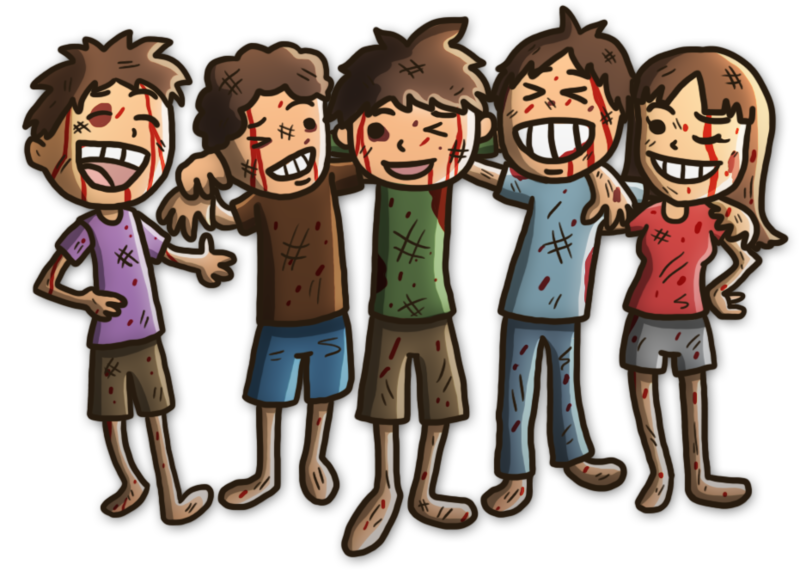 The artificial nature of the ‘groups’ constructed for the experiments, although unlikely to please most anthropologists, also means that we can rule out the effects being due to pre-existing group identities/commitments. This is just one recent empirical example, but the existence and persistence of painful ritual/social events has long been a topic of fascination (and speculation) amongst anthropologists (and more recently evolutionary psychologists) across the world and consequently many theories have been proposed to explain this puzzling but recurrent phenomenon. Many of these explanations focus on the ‘signal’ that enduring pain for a group sends, in relation to an individual’s commitment to that group, but in light of the results above, it may be that such accounts are somewhat neglecting the very real individual affiliative effect that enduring pain collectively produces. A non-ritual, contemporary example which highlights such effects nicely is the growing popularity of Tough Mudder and similar events. Tough Mudder organise non-competitive ‘races’ which are essentially large (typically 16-19 km) obstacle courses, which include features like hanging electrified wires that participants must crawl under (the ‘Electric eel’) and containers of ice filled water that participants must swim through (the ‘Arctic Enema’). – I understand that Tough Mudder is not a race but a challenge. – I put teamwork and camaraderie before my course time. – I do not whine- kids whine. – I help my fellow mudders complete the course. – I overcome all fears. There are obvious practical reasons for promoting such values but it also perhaps indicates how the sharing of pain can offer its own reward, independently from the thrill of competition and without necessarily being solely about signalling your group commitment to others. Original Article: Bastian, B., Jetten, J. & Ferris, L.J. 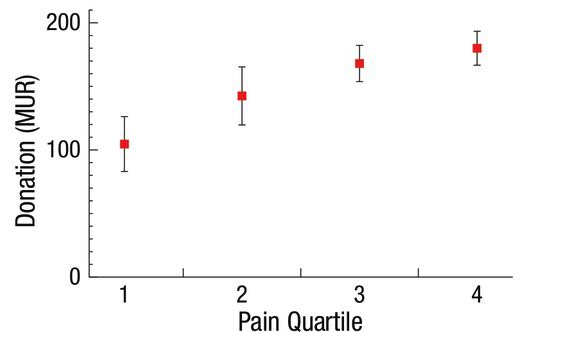 (2014) Pain as Social Glue: Shared Pain Increases Cooperation. Psychological Science. doi:10.1177/0956797614545886. Hi Chris, I’m curious now. After you posted an academia.edu link in a comment at Connor’s ‘SoR’ I recall seeing a link to a Telegragh article titled ‘Giving those Oxbridge toffs an education in the noble art’. Are you the Christopher Kavanagh of ‘Blue Blood’, the 2006 documentary, fame? On your post here, I was just getting into Bruce Hood’s ‘The Domesticated Brain’ last night when I got the e-mail for your new post. In the 1st chapter he argues that assisted childbirth is uniquely human phenomena and may have played a part in the social evolution of our species. I can see how that could be significant as a shared experience as childbirth, I’ve been told and witnessed, is a uniquely painful experience. I’ve also read that one of the difficulties that combat veterans can face in returning to civilian life can be due to the intensity of the bonds formed in combat environments and the lack of that intensity and/or depth of relationships in civilian life. Both I think speak to the power of shared pain the study elaborates. In regards to childbirth, actually that is an experience that some people in my research group were working on. Specifically, the bonding effects of enduring very difficult labour. I believe they found some interesting results but I’m not entirely sure of the outcome unfortunately, I should check it up! And with veterans, again you are pretty spot on, we’ve done research with revolutionary fighters in Libya and Iraq war veterans, and we do find much tighter and enduring bonds amongst those who experienced direct combat together. There’s a lot of connections to unpack regarding dysphoric experiences and bonding, but recently nice studies like Brock’s are becoming more common, which is a good sign! Sorry, I could have included a link – just as well you’re not(or weren’t) that CK as the ‘Blue Blood’ CK gets his nose bloodied right off in the clip I watched. Libya rings a bell(McQuinn/Whitehouse), but I can’t say the same on the childbirth/bonding/difficult labor – I’ll have to go back for a look. I first came across the phrase “social glue” reading John Bargh’s work on the unconscious so the dysphoric experience aspect is something of a new twist. – nonconscious behavioral mimicry and its relationship to affiliation – the “chameleon effect” – Chartrand & Bargh 1999, Lakin et al 2003, Chartrand, Maddox, & Lakin 2005, Gueguen, Jacob, & Martin 2009, etc.